A parallelogram is a quadrilateral whose opposite sides are parallel. 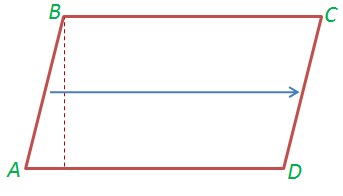 In the figure below, is parallel to and is parallel to . Now, how do we find the area of a parallelogram? Since the opposite sides of a are parallel, if we slide to the right, it will coincide with . That means that if we cut along the height of the parallelogram, the cut portion will form a right triangle containing . Again, if we slide the right triangle to the right such that coincides with , it will form rectangle as shown below. 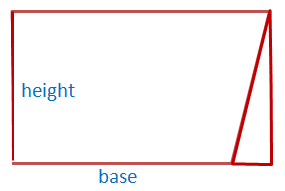 Since the area of a rectangle is the product of its base and height, and we did not remove any portion of the parallelogram (remember, we just cut and slid the triangle), the area of the parallelogram is therefore equal to the area of the rectangle. 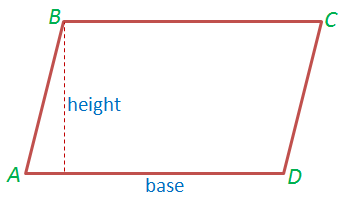 So, the area of a parallelogram is also equal to the area of the rectangle which is equal to the product of its base and its height. How do you know that the base of the quadrilateral that we assumed as a rectangle are congruent? Why is it that the resulting figure after we slid the triangle is a rectangle? Justify your answer.